Special Gudi Padwa 2019 Discount Offers on Certified Gems and Jewelry: Up to Rs 1.20 Lakh Benefits on Precious and Semi Precious Certified Astrological Gemstones, Pearls, Jewellery with Free Shipping within India. Gudi Padwa 2019, which is also known as Maharashtrian New Year, is around India. This special festive marks the beginning of a New Year, which make it a very special as the fact people love to purchase new things. And, we often see people purchasing new certified gemstones and jewelry on Gudi Padwa. Therefore, we do often see several discounts offers and deals from dealers. Here are the special discount deals and lucrative offers on certified Precious & Semi Precious Astrological Gemstones, Pearls & Jewellery that you shouldn't miss this Gudi Padwa. 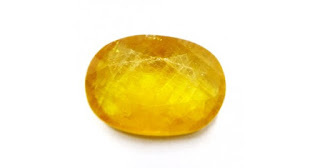 On this special occasion of Gudi Padwa 2019 Mahavir Gems Offers a special 10% off on online purchase of Certified Astrological Gemstones: Get Discounts Up to Rs 1.20 Lakhs on Yellow Sapphires, blue Sapphires, Ruby, Emeralds, Pearls and Silver Jewelry. A special FREE SHIPPING within India for a limited time is also offered along with this offer. Golden filigree work perfectly crafted for the generation of 21st century. whether worn with an open neck shirt or a simple top. An Ideal gem for a pendant, ring or a broach from Mahavir Gems. ... INCREDIBLE QUALITY Red, yellow, blue & Green FIRE on White OPAL 4.45 Cts A beautiful gem to be worn as jewellery. Opal or Upal is the birthstone for the zodiac sign Libra. It has a unique visual appeal due to the fact that it reflects lights of different wavelengths which when interact, produce a beautiful effect.As per theories, the name Opal is derived from ‘Opalus’ which is Latin for jewel. Some theories also state that it is derived from ‘Upala’ which is Sanskrit for stone. Opal is a semi precious gemstone and is used to enhance the positive effects of planet Venus. Opal’s benefits have been recognized by people down the ages. It gained popularity at the time of the Romans. Regarded as a precious stone, Opal or Upal is the symbol of hope and happiness. Opal is found in different colors. Precious Opal is the translucent to transparent variety of Opal and is the most widely used. It has a pearl-like milky opalescence and displays a beautiful play of colors when observed from different angles due to the interaction of reflected light.Upal bestows the wearer with delicate beauty, bounty and power. A mystifying gemstone, Opal passes on to the wearer massive energy.Opal is a promoter of clear eyesight and also helps relieve fatigue. Also, it helps in purification of blood. Opal reduces ill effect of pain during childbirth. By bringing clarity in thought process, Upal facilitates the decision-making process. Opal helps one to get more in touch with oneself and hence, helps in self-acceptance. Natural Ruby in a Heart Shaped 1.82 Carat / 2 Ratti an ideal gift for someone you love. ULTIMATE Rich & Rare Quality !!! Natural Earth Mined GF Gemstone!! !Nice Pinkish Red Color!!! Avail Special discount of 10% on this product for a limited time. Login to check the offers discounts available. 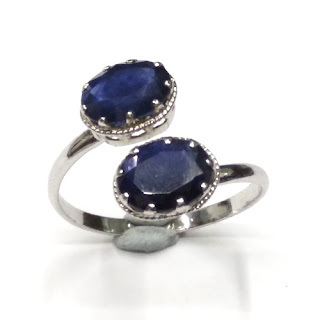 Artesian Natural Oval Shaped Blue Sapphire ( Indian Trade Name Shani / Neelam / Nila ) Ring hand crafted in Sterling Silver by Mahavir Gems. 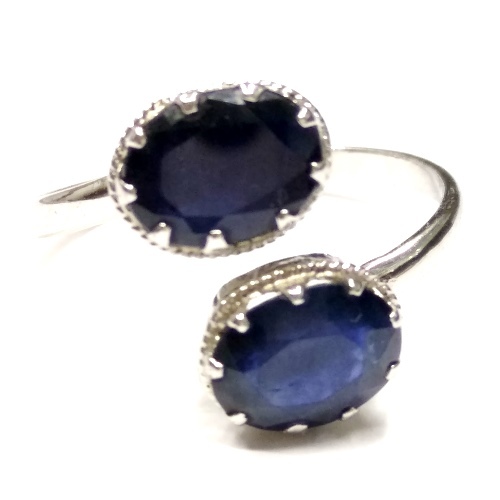 Crafted in India with Natural Gemstone Oval Shaped Natural Blue Sapphire hand set to perfection sterling silver. All our Designs are original and we believe in respecting & preserving arts. Give it as a gift or you can wear yourself. Hope you cherish our designs. Be Cool and different. Enjoy! Blue Sapphire / Neelam / Shani is the gemstone of the planet Saturn as per Indian Vedic Astrology. Wearing a natural / unused blue sapphire protects against danger, traveling problems, terror, thieves, accidents and problems from natural calamities like storms, fire, or disasters. It can be a cause of financial fortunes to change for the better, help with a person’s career, and make the wearer wealthy and prosper. It can cure one with mental anxiety. Handcrafted beautiful Natural Sard onyx pendant with complimentary silver plated chain to add to your style. A designer jewelry for the young generation. Young & Forever Navratri Jewellery & Diwali Gifts for Family and Friends. Commonly confused with the Gemstone called Carnelian. Birthstone for the people born in the month of August. 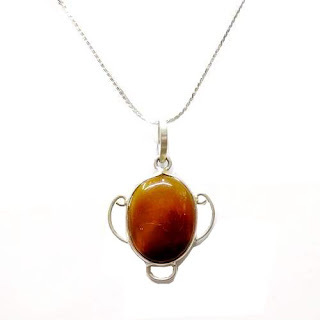 It is strongly believed that sardonyx stone would give the wearer courage and bravery that persists to modern times. Wearing a sardonyx pendant or ring is said to increase clarity of mind and the ability to concentrate. 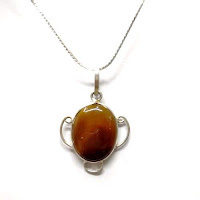 Sardonyx is also said to repel the presence of evil or ill will from the wearer. In some cultures, it is common to use sardonyx in decorating the home to ward off evil spirits. Click the below given link to visit the product page. Go gorgeous with this unique delicately hand crafted beautiful gem stone from Mahavir Gems, Mumbai, A trusted source of Natural certified gemstones online. Avail special discount on this product for a limited period. feel free to contact us for any special requirement.